A few years ago, I dropped my car off for some maintenance in Blacksburg and I couldn’t find anyone to pick me up. I happened to have my rollerblades in my car, so I strapped them on, skated three miles to the other side of town and met up with a co-worker who was stuck waiting for the cable guy. Once the cable guy had come and gone, I had my ride to work! I wouldn’t be able to that nowadays. Blacksburg prohibits and, thanks to the March 11, 2008 Town Council Meeting (which I missed– whoops), now issues a fine for skating in the downtown areas. With the center of town off-limits, I have no viable path to get from one side of town to the other. 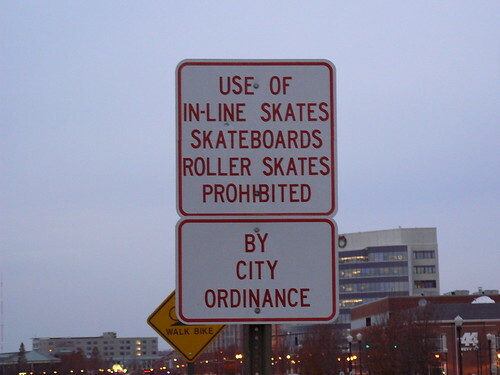 Evansville Indiana also has in-line skating ordinances. With the exception of a park in Kansas, I have complied to restricted areas. BUT, I certainly don’t agree with these types of rules. I think in this day in age with obesity and lethargy as prevalent as they are, we should not be taking steps to discourage people from being active. And with rising concerns about carbon footprints and gas prices, why discourage people from other means of travel? Well now that my two cents are out there, there is a bit of a good news. I may not be able to rollerblade across my own town, but I can still commute between towns. On Tuesday nights, I typically take advantage of the Regal Cinema’s Free Popcorn Night. Yesterday the weather was nice and I had just enough lead time, so I rollerbladed from Blacksburg to the theatre in Christiansburg, via the Huckleberry Trail. 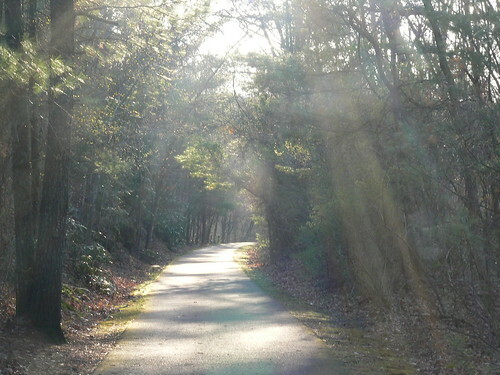 The Huckleberry Trail is always beautiful, especially in the spring with all the Bradford Pear trees. But with a little less room in this world to skate, yesterday this paved path seemed more stunning than usual. 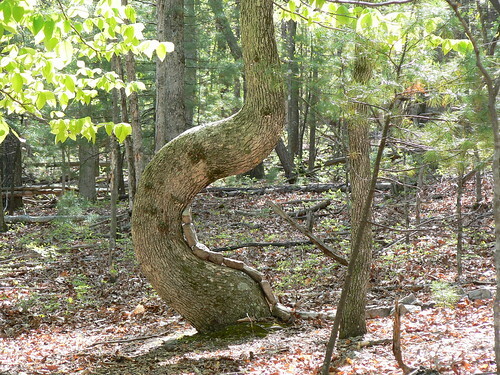 I’m continually amazed by perseverance of trees. I’ve seen plenty that manage to thrive despite less than optimal conditions. 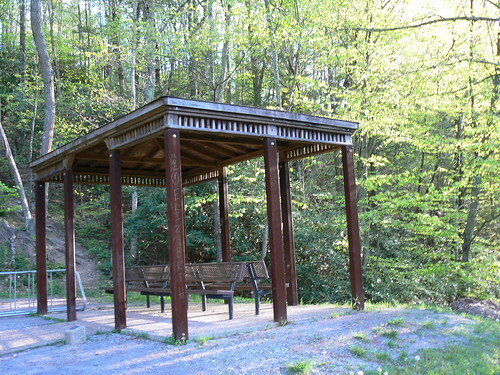 Tony and I ran across another resilient example today on the Huckleberry Trail. 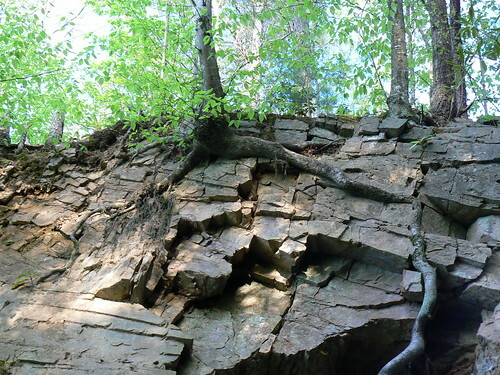 This particular tree is growing on the rocky hillside near Mile Marker 5. Check out the root. 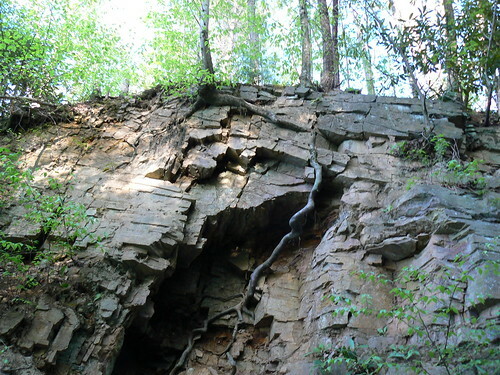 It snakes around rocks and down, down, down until it finally reaches nutrients. This tree grew in a perfect half circle. Hikers and bikers have lined stones up to and on the tree. 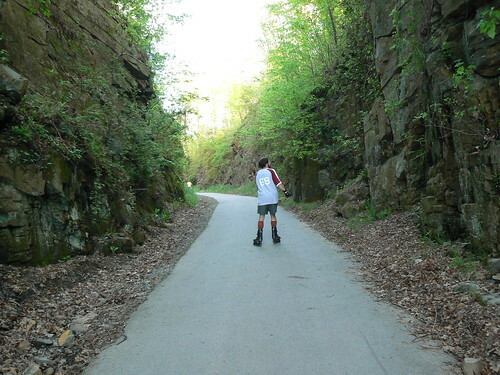 For six years now, Tony Airaghi and I make it a point to rollerblade the Huckleberry Trail at least once each year. It was a gorgeous spring day out today, so it was a great day for us to continue our tradition into 2007. 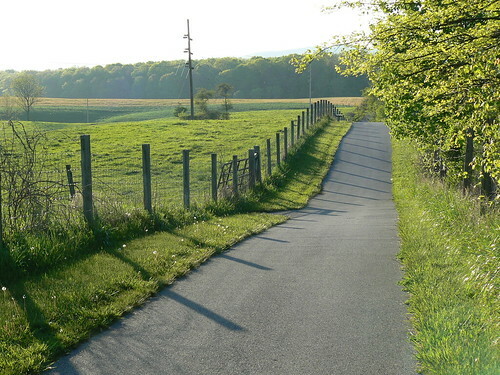 The Huckleberry Trail was a Rails to Trails conversion. What was originally a railway built in 1902 to transport coal evolved into a passenger line between Blacksburg and Christiansburg. 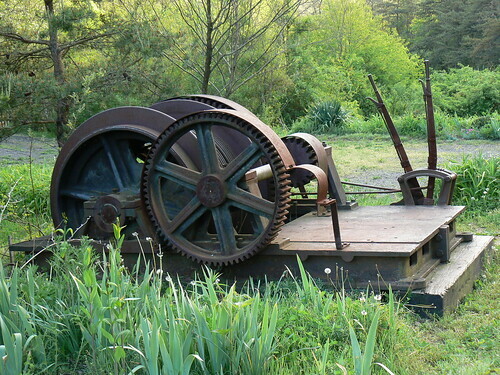 That line stopped seeing use in 1958 and over three decades later the area evolved again. It became a fully paved pathway, slightly over 5 1/2 miles, from the Blacksburg Library to the New River Valley Mall. It is perfect for rollerblading (though the area near Margaret Beeks Elementary School could use some smoother pavement) and brings with it a variety of sites and scenery. You go over a quaint bridge over Southgate, by the Corporate Research Center / Virginia Tech Airport, next to cow fields, through a tunnel under 460, past the Coal Miner Heritage Park, along a bridge over active train tracks, through rocky outcroppings and finally the mall. 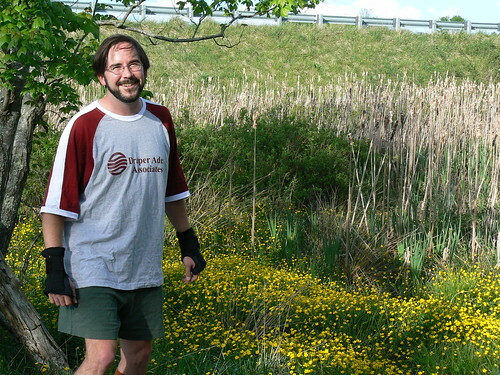 Tony poses by some wildflowers and cattails off the trail (Between Mile Markers 2 and 3). VA-460 is in the background. 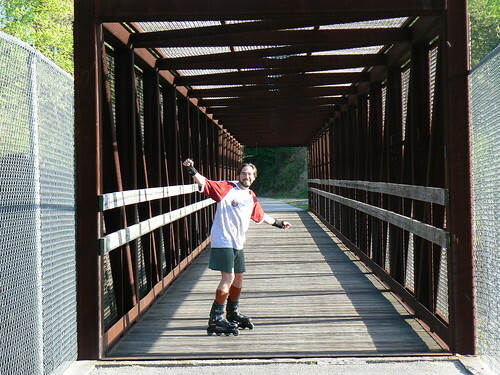 Tony on a bridge that passes over an active railway (roughly 3/4 miles from the New River Valley Mall). In past years, we’ve skated that bridge as a train passed beneath us. Tony skates a section that is surrounded by steep rock walls (close to Mile Marker 5). In the summer, delicious wild raspberries and blackberries grow on the rocks.